Slice the challah into 1 inch slices, and then cut the slices into 1 inch chunks. That's approximate, don't get out the measuring tape. Whisk together the eggnog, half and half, and eggs. Pour over the bread cubes, reserving 1 cup of the liquid for later. Toss the bread so it's all coated with liquid. Cover with foil and let sit for an hour. Pulse all the streusel topping ingredients together in a food processor until crumbly. 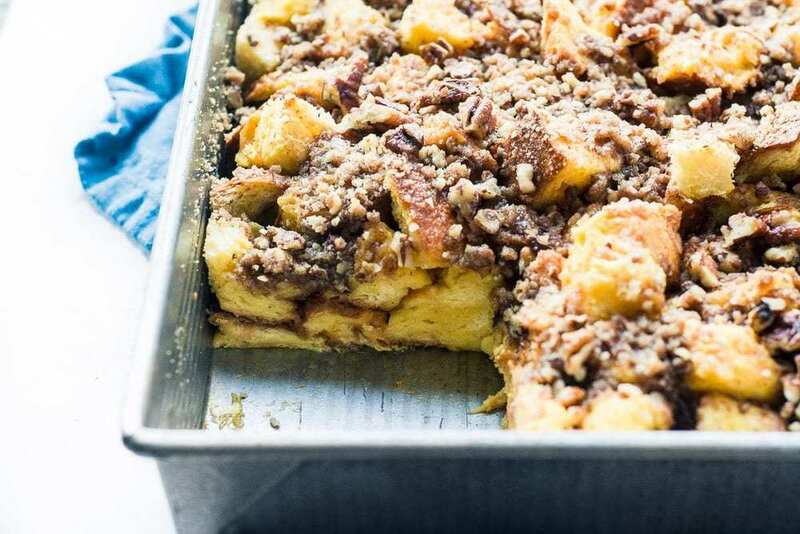 Pour the rest of the liquid over the bread, and top with the streusel topping. I like to use my fingers to make larger 'crumbles' out of the mixture. Cover with foil and bake for 30 minutes. Remove foil and bake for another 30 minutes, or until cooked throughout.